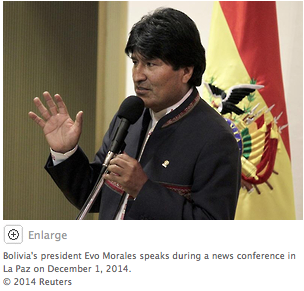 (New York) – Bolivia should amend several laws that undermine the rights to freedom of association and expression, due process guarantees, and children’s rights, Human Rights Watch said today in a letter to President Evo Morales. 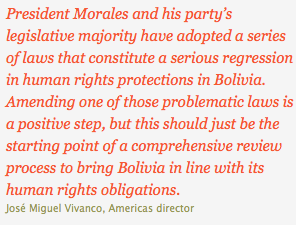 These laws, which are incompatible with Bolivia’s international human rights obligations, were approved during Morales’ second term, from 2010 through 2014. On December 3, the Plurinational Assembly approved a key modification to a 2010 problematic law that regulates procedures for the criminal prosecution and impeachment of high level officials and magistrates. But changes are also needed in other recent laws that significantly restrict the exercise of basic rights – on child labor, regulation of nongovernmental groups, torture, and racism. Bolivia’s 2009 constitution provides for the protection of a wide range of basic rights, including freedom of association and expression, due process guarantees, and children’s rights. Although the constitution says that international human rights treaties ratified by Bolivia that include broader protections prevail over the constitution, several of the new laws significantly restrict the exercise of these basic rights. The revision to the 2010 law on the prosecution of high-level officials modifies provisions that allowed senators to impose criminal sanctions on judges from high-level tribunals, including the Supreme Court and the Constitutional Court, undermining their right to be judged by an independent court. The reform was supported by Vice President Álvaro García Linera. A 2010 law against racism, later supplemented by a decree from the president. The new measures grant the government vague and overly broad powers that allow it to unjustly censor the media, failing to strike a proper balance between the government’s legitimate concern to combat racism and the right to free expression. Under international law, restrictions on freedom of expression should be defined precisely and applied by an independent body in a strictly proportional manner. Criminal sanctions should only be imposed in exceptionally serious cases. The assembly has also failed to modify the 1976 Military Criminal Code, which allows military courts to try alleged human rights violations committed by members of the military. A 2012 Constitutional Court ruling held that the code violates Bolivia’s international human rights obligations, which require that human rights violations be tried by independent and impartial courts, and called on the legislature to modify its provisions. There are over 600 Bolivians that had to flee to the non-existence of an impartial justice system. Politicians like Leopoldo Fernandez, Mario Cossio, Roger Pinto and others remain under political persecution and their trials are tinted. Like the alleged terrorism case. Lets not forget that brutal police aggression to the TIPNIS indigenous people at Chaparina, when they were walking towards La Paz city to protest against the intent to cut in half a National Park and Indigenous territory with a road that was mainly going to be used for illegal coca plantation that would turn to cocaine. Lets not forget the dozens of citizens lynched by the “community justice” which is no more than a barbaric atrocity that came to use, out of the hate and resentment that the masistas hold onto as part as their political speech. The violent dead in Porvenir – Pando, La Calancha – Chuquisaca are also a sorry result of this incompetence, mostly due to political maneuvering of current ruling party… , they are also not forgotten. This entry was posted in Bolivia, Business, Crime and Violence, Drug war - narcotraffick, Economics, Health, Politics, Social Unrest, TIPNIS and tagged community justice, demagogue, human rights, MAS does more damage than good, Ochlocracy, police aggression, political persecution, public policy failures. Bookmark the permalink.